This article stands on its own, but is also part of a series on free software. 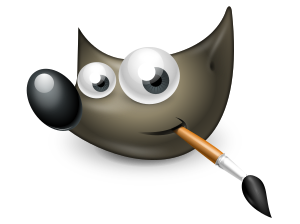 GIMP is a “Free & Open Source Image Editor. In this article I will look at some of the basic functions a website content manager needs to perform. The opening screen for GIMP image manipulation software. I will also compare using GIMP to using Windows Paint, Photoshop Elements and Photoshop. Learning new software is generally a disruption in your workflow, especially when you have become proficient in another piece of software that does the same task because you don’t have to stop and remember the next step. But, the cost savings may be worth the learning curve. 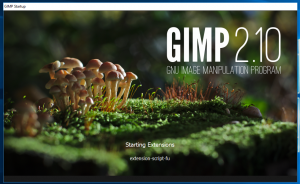 The first impression I had of GIMP was surprise. It has a very professional start up screen. My second impression was, “Oh, No! Another black interface.” But, I figured that there was probably a way to change the interface color scheme, and I was correct: Edit -> Preferences -> Interface -> Theme. The interface is now a light gray, but, oh dear, the tools are also very light. The seemingly grayed out tools are a bit of a UX blunder. 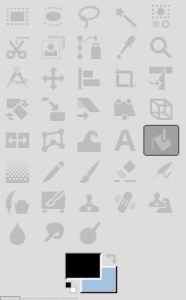 GIMP pretty much uses the normal tool icons, which is a big efficiency booster. In earlier versions of Photoshop, all images started as .psd files (Photoshop Documents). That’s because .psd files keep information about the layers, while .jpg and other file types that work for publications and the web have the layers flattened. Now, if you open a .jpg in Photoshop, it remains as a .jpg until you add something that needs to be in a .psd format to work. The native file type for GIMP is .xcf. To save as a .jpg, you have to do an Export. with the way files are saved. 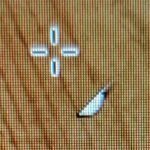 The GIMP cursor icon is different from other software in that it is made up of two parts. For some reason, cropping seems to be done differently in each image manipulation program. With Photoshop, you choose the tool, draw a box and click the no smoking sign if you don’t like the box or the click the check if you do. Then the crop is finished. In Paint, there there isn’t a toolset, like there is with PhotoShop and GIMP. Instead Crop is a command that is only available after the Select Tool has been activated. If the last action in the program involved selection, then the selection tool will already be activated. But, if the text tool was the last tool used, the select tool has to be reactivated. 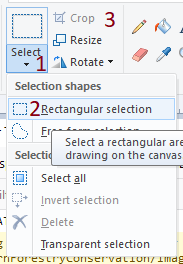 Then you can draw a box with the select tool and click Crop. There is nothing that allows you to choose a very specific measurement on the crop, except eyeballing the ruler. The cropping function in GIMP is more robust than in Paint. One feature I especially like is the ability to move and resize the crop area before you crop. This is done with a square widget on the corners that is different from any other imaging software I’ve used. The cursor icon changes. I have had this book on my shelf for years. Well, they keep disappearing when I loan them out, so the one on my shelf is always a recent purchase. Why is the WordPress Kahuna Theme Messing with my Images? Google AMP: Another Technology to Take Over the World? How Do I Get Google Analytics and Google Search Console?